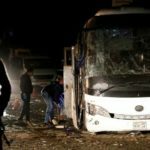 Pictured: The wreck of the tour bus that was bombed by militants in Egypt. 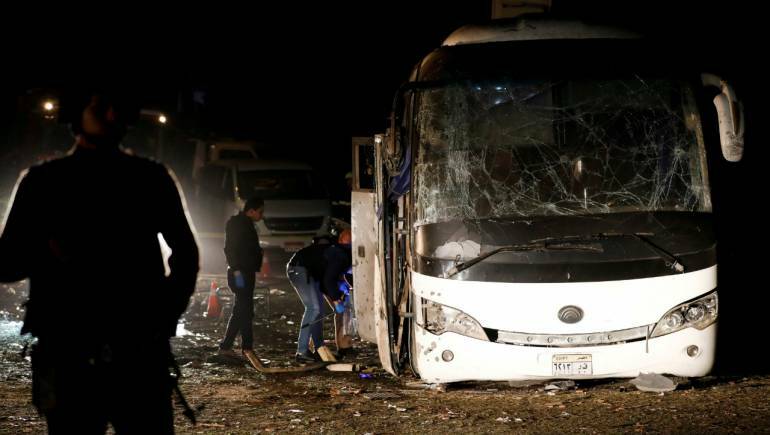 Egyptian security forces have killed 40 suspected militants in three separate incidents in North Sinai and Giza a day after a bombing on a Vietnamese tourist bus in Giza killed four people. The bombing, less than four kilometres from the pyramids, on the outskirts of Cairo, is the first deadly attack against foreign tourists in Egypt for more than a year and comes as the tourism sector, a vital source of foreign currency, recovers from a sharp drop in visitor numbers since the country’s 2011 uprising. A spokesman for Britain’s Thomas Cook travel group said it had cancelled day trips to Cairo from the Red Sea resort of Hurghada following the attack and it would continue to review the security situation. The ministry did not say whether the suspected militants were connected to Friday’s attack but said its forces killed 30 people during raids on their hideouts in Giza, where it said “terrorist elements” were planning a series of attacks targeting state institutions and the tourism industry. Security forces also killed 10 suspected militants in North Sinai, where the country is fighting an insurgency led by the Islamic State group. The ministry did not give any details about the suspects’ identities or whether there had been any casualties or injuries among the security forces. The statement said the three raids took place simultaneously.